4 hours agoPaper Straws Pop Up in Magic Kingdom5 hours agoMenu Mania: Cookie Dough, Cupcakes, Cinco de Mayo, Mother's Day, and More Menu Updates!5 hours agoMagic Kingdom's Parking Lot Trams Relocated While TTC Under Renovation12 hours agoDisney Pic of the Week: Monorail Transportation1 day ago"Rivers of Light" Nighttime Show at Disney's Animal Kingdom to be Updated2 days agoHow to Get the Best View of Disney World Fireworks and Shows3 days agoIs Disney Trying To Change The Way You Travel? 1Photos: Otters Have a New Grotto at Disney's Animal Kingdom! When Coronado Springs' new Gran Destino tower opens in July 2019, a new restaurant will also debut at the resort. Three Bridges Bar & Grill will be on an island in the middle of the resort’s 14-acre lake, Lago Dorado, accessible via walkways. There will be private event and group spaces adjacent to Three Bridges. 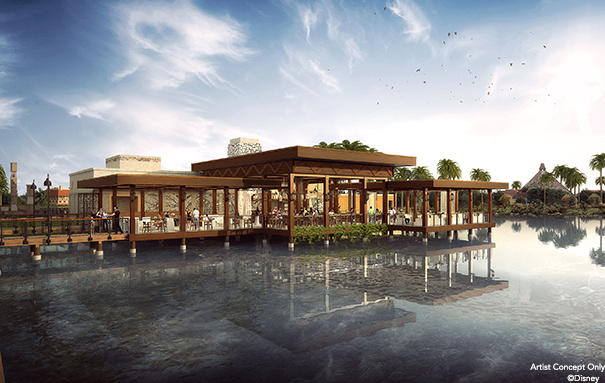 The entire area including the restaurant and group space will be called Villa del Lago.